Pusha and Drake are entertaining, but these lyrical disses changed the game. No, I'm not talking about the Notorious B.I.G. song from his album, Life After Death. I’m talking about the conflict you have when someone gets under your skin and you feel the need to address it. Hip-Hop was built on battle rap. Back in the day, there were cyphers and MC battles at every party. We saw The Get Down, right? That’s how it all started. Now, hip-hop is experiencing the “glow up”. No longer doing basement parties or gatherings in abandoned warehouses, the rap genre has embraced technology. With social media, a tag of a name has suddenly turned trigger fingers to "Twitter fingers". We have YouTube and Snapchat now as well. If someone has beef with another and really want to let them know, all they need to do is upload a video. In hip-hop there are a lot of beefs. In fact, I could probably fill a book if I tried to discuss them all, so I won’t. Even though there are a lot of beefs, there were only a few that changed the game. With the recent Remy Ma and Nicki Minaj beef, why not look back at a few notable ones. That was also a diss track, but not one of the most noted. In 1985, a group named Juice Crew released a song titled, “The Bridge”. MC Shan of the Juice Crew stated that the song was about how the group got started. However, when KRS-One of Boogie Down Productions heard the song, he thought that they were claiming that hip-hop started across Queensbridge. This is one of the first hip-hop beefs that gained a wide audience. Both songs were more than just two crews going back and forth at each other, they were songs that you could play on the radio and in the car. It wasn’t just an argument with music in the background. To answer to the Juice Crew track, KRS-One and Boogie Down Productions released the song, “The Bridge Is Over”. This is one of my favorite diss tracks. If this was a physical fight, they answered a shove with a full out swing. This is a prime example of how a track could end a career because after this song was released, we didn’t hear a lot from MC Shan and the Juice Crew. “The Bridge Is Over” set the bar for future diss tracks to come. By now, most of you have seen Straight Outta Compton, and just like every other music biopic, we saw our favorite artists rise to stardom, only to be taken advantage of by their greedy manager, as well as signing contracts without reading them. We also saw in the film how Ice Cube was not cool with being broke, after writing most of a groundbreaking album that helped start gangsta rap. That led Cube to pursue his successful solo career. 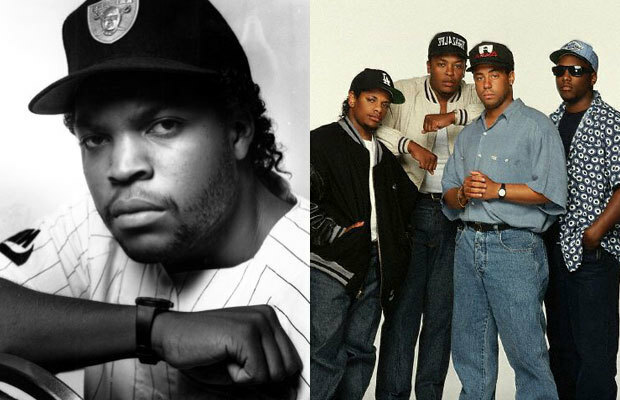 The remaining members of N.W.A. felt some type of way, and threw a few shots at him in regards to the situation. This did nothing but fuel the fire for him to release “No Vaseline”. If you were looking for punch lines, this track gave you everything. He basically lined N.W.A. and their manager (Jerry) up, and took head shots at them all. He delivered a blow that was hard to come back from. The track didn’t end anyone’s career, but it did make them think twice. In the end, the guys reconciled and remained real life friends. The previous beefs mentioned were like early Mike Tyson fights—they were done with one punch. Nas and Hov traded a few blows starting with a line in the song, “My Mind Right”, where there was an insult that seemed to be directed at Nas. After that, Nas decided to take a jab or two in his mixtape. It got real when Jay released “The Takeover”. On the track, he took it all the way there, pulling Nas apart album by album. It was a hard track, however, Nas answered back with a right hook on the track, “Ether”. He went crazy on the track and let Jay have it. I mean, the very first line of the song gave Jay the middle finger. He tells Hov exactly how he feels about him. Nas murdered him on that track. Like “No Vaseline”, this track obviously didn’t end Jay’s career, but it did bruise his ego a little. Jay took a cheap shot on his track titled, “Supa Ugly”, saying that he slept with Nas’ baby mama. Later, Hov ended up apologizing for the line. This didn’t matter because there were still many fans that felt Nas still won with "Ether". I know the beefs I have mentioned are 10–20 years old. Now I'm talking about Kendrick Lamar. He came during a change in hip-hop. Everything was getting flashier, the lyrics were less complex and their jeans got tighter. Folks were rapping less about where they were from, to what they had. Not saying that all the '80s and '90s rappers just talked about where they were from. They had their fair share of bragging as well. It’s just that now, since the artists are younger, they have a different way of marketing themselves. The game changed. Now you can stream music from various outlets, more artists are getting endorsements and all artists aren’t coming from the bottom. Some of these folks are well-off, but like to rap. Therefore, they have different things to rap about. On the track “Control”, Kendrick had a verse that called out everyone that was hot in hip-hop at the time, and it shook a lot of folks up. He called out everyone in the game. He explains that he grew up on Eminem, Pac and Big. I guess he wasn’t happy with the way things were going. He made everyone step their game up with that track. 5. Tupac Shakur vs. The Notorious B.I.G. I chose to save this beef for last. All the other beefs I’ve mentioned previously went bar for bar. They boosted record sales and artist popularity. This beef did all of that and then some. This is the only beef in hip-hop history that divided a country. This was crazy because these two were friends, but unfortunately, things went south. Both of their unsolved deaths are possibly hip-hop’s biggest mysteries. I could go on and on about these two, but let me just stick to the tracks. These guys had more than one. Sticking to the boxing analogy, their fight was more like a Mayweather fight. The beef went on for a while, which produced a few diss tracks towards one another. Biggie had “Who Shot Ya”, “Long Kiss Goodnight” and “Down Fall”. The man Pac had “Hit 'Em Up”, “Against All Odds” and “Bomb First”. Biggie and Tupac’s beef sparked the East Coast/West Coast war that went on for years. Even 20 years later, we still have people trying to compare the two (which is impossible). They were both before their time, which is why we can listen to their music now and it will not sound out of place. All the MCs in the game right now still have not seen an artist accomplish what these two have. Nope, not even your precious Drake. In the end, there was no winner. Both were murdered and the fans suffered the two losses as well. We will never come across greatness like these two again. So yes, Remy and Nicki provided us with a fun beef, but they were not the first, the last or even the most entertaining. Let’s not forget the Drake and Meek Mill craziness. I will not count Soulja and Chris Brown. That’s just doing too much. I believe that the five I covered had the biggest impact on the game so far. These beefs were all about the bars. Nobody cared about how many followers the other one had, or how much money they were worth. It was all about the music, and it should stay that way when it comes to rap beefs. We see what can happen once it gets out of hand and outsiders are involved. Our favorite rappers end up losing more than reputations.